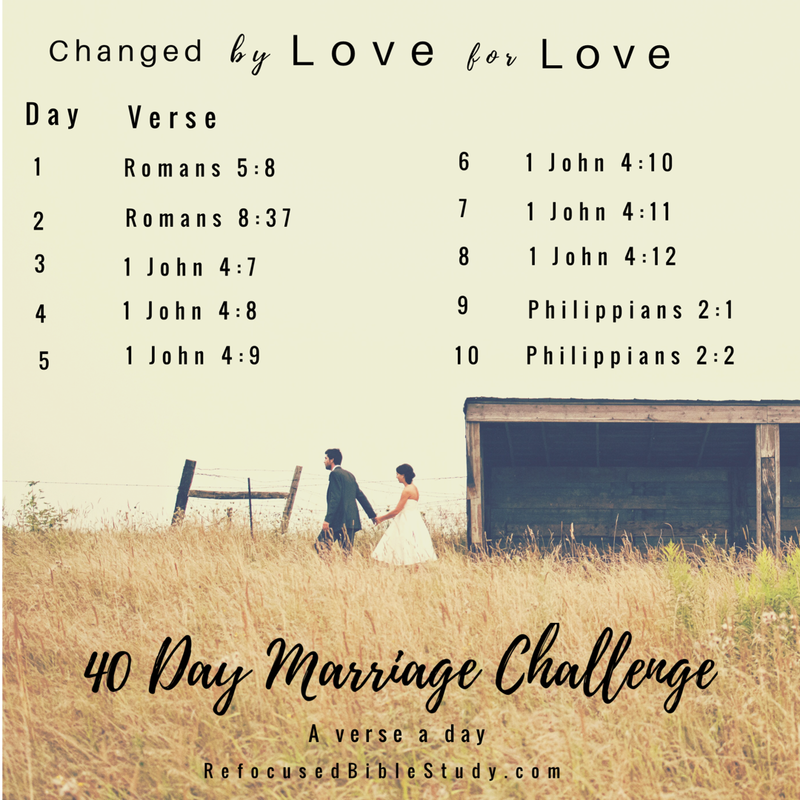 It’s day two of the 40 Day Marriage Challenge here at Refocused Bible Study. This whole chapter is so good! Especially v.31-39! O – Observations – “all these things” in the verses leading up to this one include: trouble, calamity, persecution, hunger, coldness, endangerment, and being threatened with death. These were serious troubles believers were facing. Paul was able to pen these words through the Holy Spirit because though these were real fears, Christ had already given them victory by conquering sin and death on the cross. 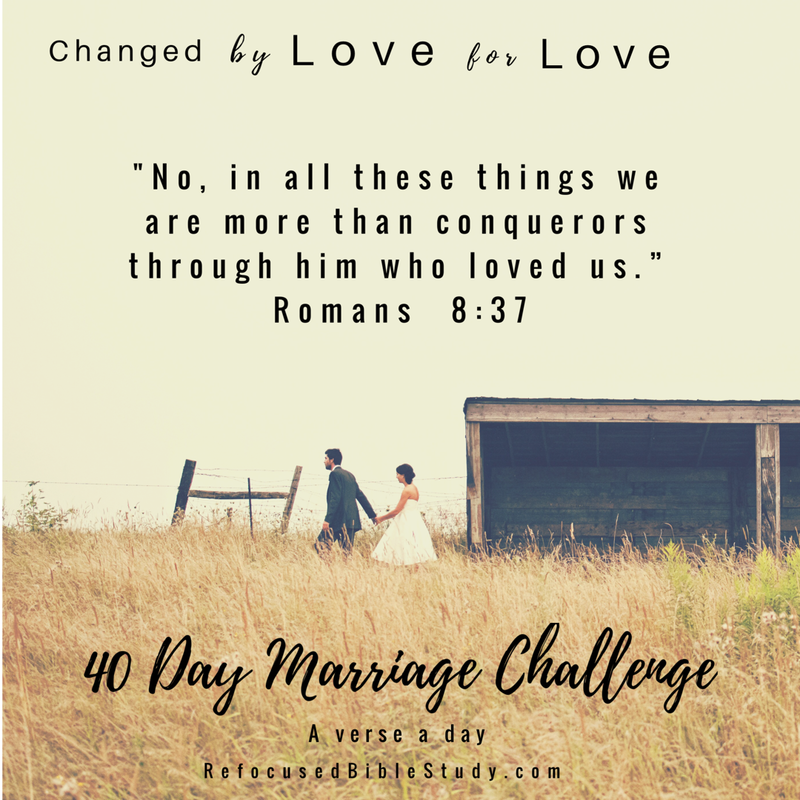 V- Verse pertains to marriage – Jesus’ victory on the cross brings us victory in marriage. We face real troubles and stressors in marriage. (If you are in physical danger in your marriage please get to a safe place and seek professional help, but continue to seek Jesus’ help!) All issues are won on the cross. Jesus loves you and your spouse no matter what’s going on in your relationship and he is FOR you and your marriage. Believe he is allowing any trial to bring good and to strengthen your relationship to Him and your relationship with your husband. Today pray for one area in your marriage that is lacking. Trust God to bring victory in His power and timing. E- end in prayer- Inseparable Savior, thank you for victory in my marriage – over any opposing force in the spiritual or physical realm. Keep pushing back the darkness and bring victory in all areas of my marriage. For your glory, Amen. Absolutely, Stacy! I was thinking of how much your family has overcome when I posted that question. What a testimony to God’s faithfulness. She is a true joy & ya’ll are a couple firmly rooted in Christ!